1. Systematic conservation planning has been applied to terrestrial and marine systems for over a decade, but only recently been used for freshwaters. Of the various methods proposed, those that explicitly include the costs of, opportunities for and constraints on conservation actions are the most defensible because they allow transparent, rational decisions to be made about conservation priorities. 2. Applying these procedures to freshwater systems presents a number of challenges, including accounting for lateral, longitudinal and vertical connections, and the dynamism and resilience of freshwaters in space and time. 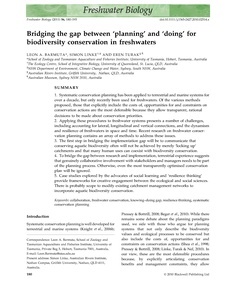 Recent research on freshwater conser- vation planning contains an array of methods to address these issues. 3. The first step in bridging the implementation gap will be to communicate that conserving aquatic biodiversity often will not be achieved by merely ‘locking up’ catchments and that many human uses can coexist with biodiversity conservation. 4. To bridge the gap between research and implementation, terrestrial experience suggests that genuinely collaborative involvement with stakeholders and managers needs to be part of the planning process. Otherwise, even the most transparently optimised conservation plan will be ignored. 5. Case studies explored by the advocates of social learning and ‘resilience thinking’ provide frameworks for creative engagement between the ecological and social sciences. There is probably scope to modify existing catchment management networks to incorporate aquatic biodiversity conservation.